AT16A04 Stug 3G saukopf main gun mantlet and cupola shot deflector. 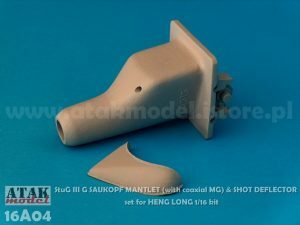 AT16A04 Stug 3G saukopf main gun mantlet and cupola shot deflector. Fine cast of resin with excellent detail, shot deflector has necessary weld beads.